​How Do You Divide Radicals? When you're multiplying radicals together, you can combine the two into one radical expression. There's a similar rule for dividing two radical expressions. If you have one square root divided by another square root, you can combine them together with division inside one square root. This property can be used to combine two radicals into one. 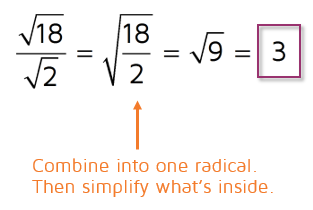 It can also be used the other way around to split a radical into two if there's a fraction inside. Notice that it says b cannot equal 0. This is because b is in the denominator and you can't divide by 0! An expression with 0 in the denominator is undefined. Think of the word NO to help you remember. What about 0 in the numerator? It's OK to have a 0 in the top of a fraction. 0 divided by any nonnegative number is just 0. To divide two radicals, you can first rewrite the problem as one radical. The two numbers inside the square roots can be combined as a fraction inside just one square root. Once you do this, you can simplify the fraction inside and then take the square root. First, combine into one radical. Then simplify what's inside. Don't forget to look for factors that are perfect squares. If you need help with this step, make sure to check out the lesson on simplifying radicals. ​First, combine into one radical. Then simplify the fraction on the inside. Make sure to continue simplifying until there aren't factors left that are perfect squares. 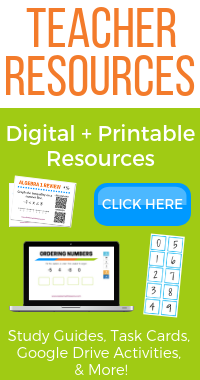 Want to see the lesson on multiplying radicals?